DP Dalek and a Mechonoid! 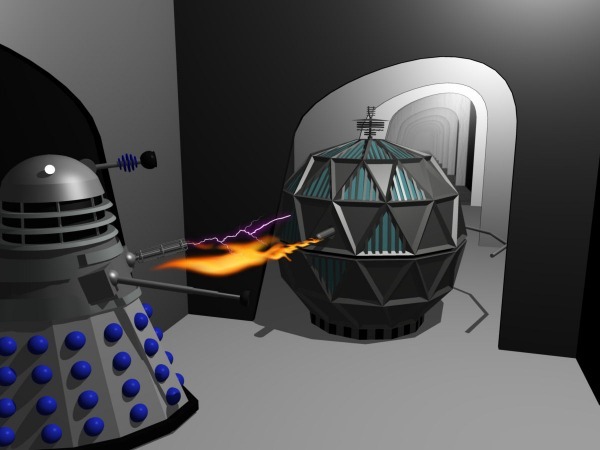 Lets start at the start for the images, this shows the very first type of dalek that there ever was! It was in the second ever Doctor Who episode, making it the very first Doctor Who monster. There are a couple of errors in this picture, can you guess what they are? I am sure you can, but I can't wait for you to tell me so I will have to tell you myself. 1. The Mechonoid; Never met that style of dalek, by the time the mechonoids appeared on the scene, the daleks had slats, and they most ceratinly weren't in the dalek city! 2. The Gun; The daleks used to shoot negative tv effects! not lightning blots, although that would have been spectacular! 3. It was in black and white, but I will let you off if you didn't get that one. The image is still okay, as if it was an on set photographer! 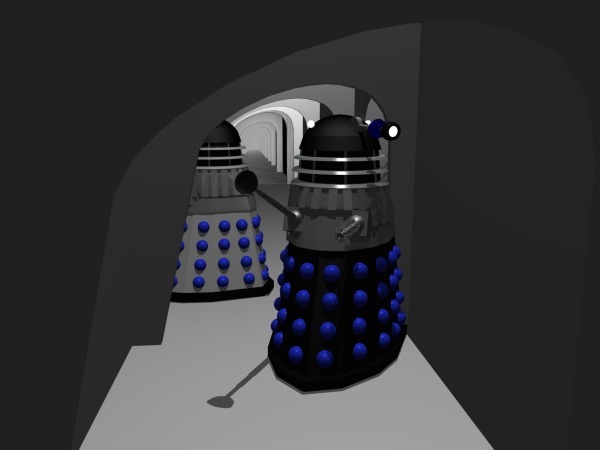 I made the set even though it does resemble Adam Bullocks (another person who does CGI of daleks in Anim8or), although I did use the picture that he used for the lovely 'end of corridor' effect, just like the one in the episode. I made the mechonoid first, then I actually made the dalek to go with it, but I wasn't ready to face attempting to make slats at that stage! When I started with Anim8or I came out with this! Except back then I did not know how to use shadows and it looked a lot worse! I have learned a lot of things since then including how to make the skirt look like it is not one big cylinder. Just to see the difference of 2 months! They are from the same story as well! I guess two months does make a lot of a difference. 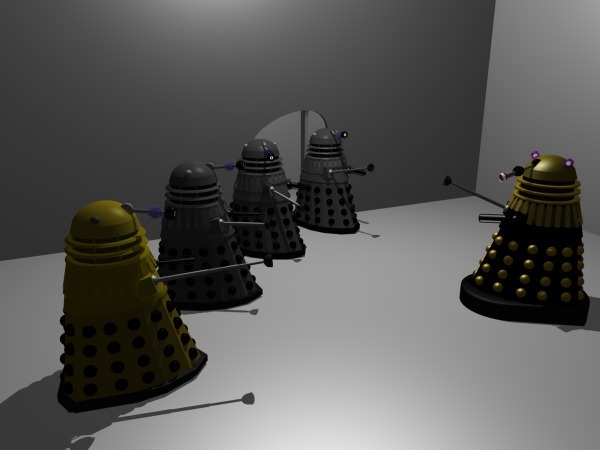 Some daleks from the first Doctor Who movie made in the sixties, these were very fun to render because of the nice colors they had, all the TV daleks seem to be in silver or grey! 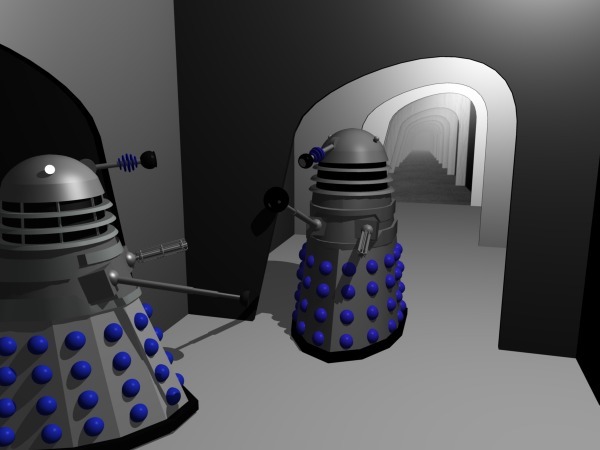 At the moment the daleks are in a hallway in their city, I am working on the control room at the moment so when I have done that some more pictures of these guys will be up here soon enough. 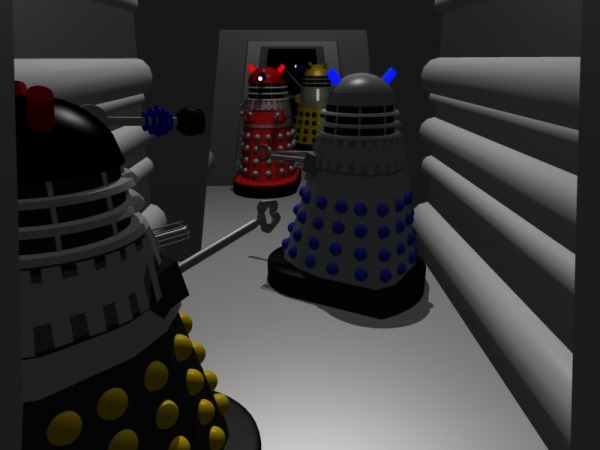 Here we are racing through the 60's so I have to now show you the daleks from the SECOND Doctor Who movie. If I were properly going through the history of the dalek props the show would have had some more paragraphs devoted to it but they are coming up soon enough so don't feel like you are missing out or anything! I have no idea where this scene is located to be perfectly honest. Ther are in some sort of hallway or a VERY clean mine. It just seemed to fit the style of the movie at the time of modeling so I just went for it! This was my first attempt at slats and mesh (like it says in the title), and i am very proud of it. how annoying it is to place the slats and the hemispheres! 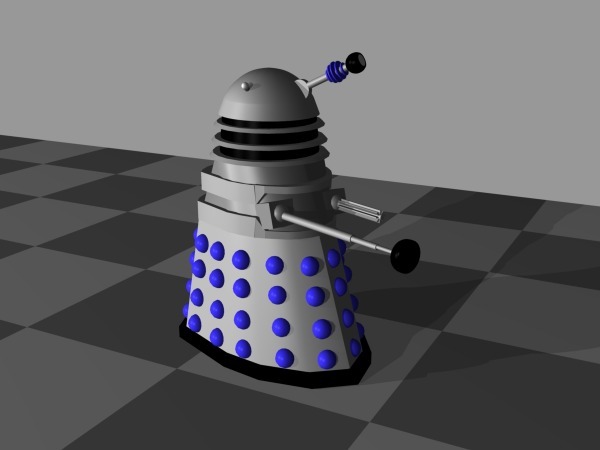 It is the hardest part of dalek modeling in my opinion, unless I am missing something hilarious. Here is the ultimate ironic situation, or annoying situation, it could quite possibly be both! 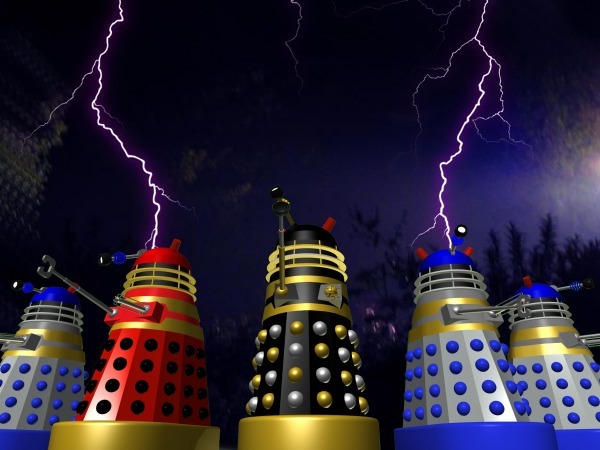 When Doctor Who finally came to our television sets in color all the daleks turned grey! There was really only two daleks that were otherwise, and they both only appeared in one episode each. 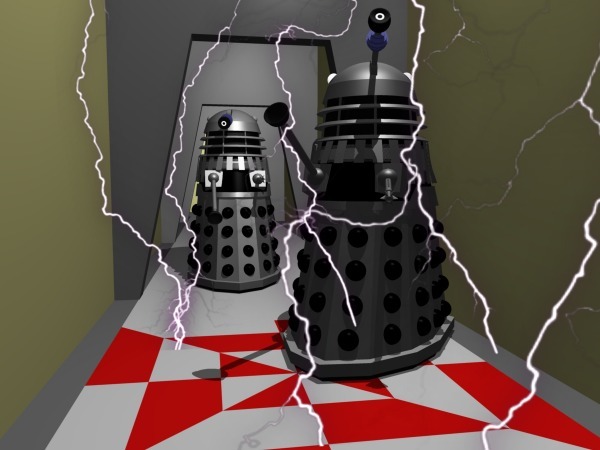 They also both feature in this picture of daleks in a blank room! of my new way of making lightning! I think it is rather good if I do say so myself! 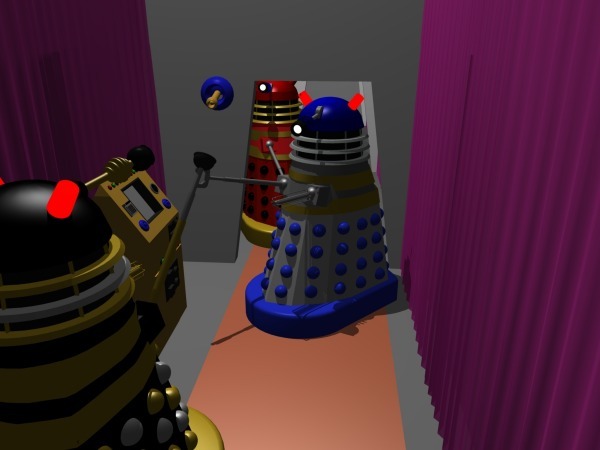 It also used my new Death to the Daleks models. The last time they appeared in silver. 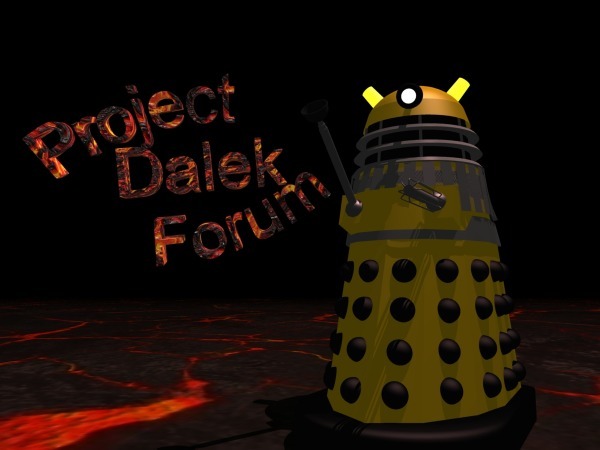 This was a render I did as a tribute to Project Dalek Forum. It was done with the gold movie dalek from the second of the peter cushing films. And it was also a nice test of all my new lava textures! 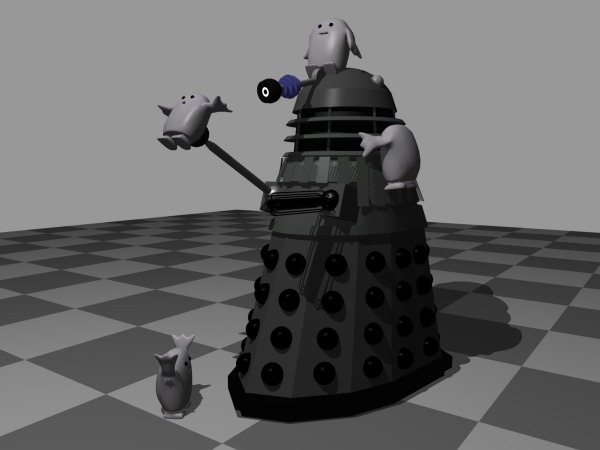 Adipose attack a Genesis Style Dalek! This was made mere hours after the first episode of the new series of Doctor Who aired in Britain. I am very fond of my Adipose, but there are many flaws which I need to fix. Here is a background which is 2400 x 1800 pixels in size. I used to have it on my computer, but I have a different Laptop now with a different sized background, I hope you enjoy this one as much as I did! Due to site refurbishments, when you click on this image it will appear as a pop up image, but it will be WAY to big! So what you have to do is either press Ctrl+Click or Shift+Click to make it open in a new window or tab. Then you can see it closer up! This was an early image. This wasn't my Mechonoid model I made later, it was made by Adam Bullock. But I have my own now (thanks to his help)! This was made when I was going through a 'funny' stage. So there will be a couple of one with hilarious little tags on them! My look into the mind and conscience of the common Dalek. A bit disturbing, but it really is Daleky! I am sure all fathers/mothers here will really appreciate this image. It is something that happens at the best and worst of times, and is awful when it does! This was a card I made for easter (a while ago now!) and was a take off of...well I am sure you can all guess. This image was created to show how very much I love my laptop. Only on special occasions of course.